When: Tuesday, December 31, 2013, 7:30 p.m. Scouting Report: Last year, Kellen Dunham was the new kid on the block. He came in as a freshman and became a solid contributor as a part of the supporting cast. Now it is practically his team, he gets the most minutes and has the most points on a Bulldog team that has done pretty well for themselves since Brad Stevens left to coach in the NBA for the Boston Celtics. Dunham is a gritty guard that can score from anywhere. He can drive inside or take the outside shot. He averages 18.1 points per game, 4.9 rebounds per game, and 1.9 assists per game. He is also one of the better free throw shooters on this team, shooting close to 80% from the line. Helping him out is Khyle Marshall. Marshall is coming off of a big game against N.J.I.T. where his play led them to victory. He is the other high scorer on this team, with 17 a game. He is also a solid rebounder, grabbing 6.7 boards per game. He is a solid attacking force inside, but unlike Dunham he does not enjoy going to the free throw line. He has had a hard time converting on foul shots, only shooting 54% on the season. Most of the offensive production has come out of the tandem of Dunham and Marshall. They’ve gotten the job done carrying the team on offense. Dunham, a sophomore, and Marshall, a junior, are getting better as the season goes on and are getting better each day. While opposing defenses focus on these two, it opens it up for other Bulldogs to quietly rack up points. Case and point being the other big man inside, Kameron Woods. Woods is a double-double machine. His season averages are just a few decimal points away from being a true double-double (9.6 points per game and 9.8 rebounds per game), but he’s gotten three of them so far this season and has come close on many occasions. His great rebounding ability is showcased through his numbers, as he has grabbed over ten rebounds in a majority games his season. Butler is pretty deep, and in various games this season, their bench has been the difference maker. They are able to produce and go into different lineups and configurations as their starters catch a breather. As a team, Butler’s weakness has been at the free throw line. Overall, they shoot only 65.6% from the free throw line. They played Marcus Smart and the high ranked Oklahoma State Cowboys tough, what cost them the game was the inability to sink crucial free throws late in the game. Outlook: Butler is a pretty good team, and will look to make a case in front of their home crowd as to why they should be back in the top 25 club. Both of their losses were heartbreakers, losing by two to then ranked #5 Oklahoma State and then following up with a loss in overtime to LSU. Villanova’s looking to bounce back after losing to Syracuse. In a way, this is the start of a new season, conference play is different. Teams are likely to play more than just once, and seeding for a conference title matters. Butler doesn’t have the size that Syracuse had inside, so that is a plus for the Wildcats. Daniel Ochefu saw limited action in the Syracuse game because of foul trouble. He’ll get his chance to put the paint on lockdown, he needs to keep Woods in check. He has the size advantage but Woods will play him with everything he’s got. On the flip side of things, JayVaughn Pinkston was contained for the most part by Syracuse’s big men. He will have his opportunity to get back right on track against Butler. 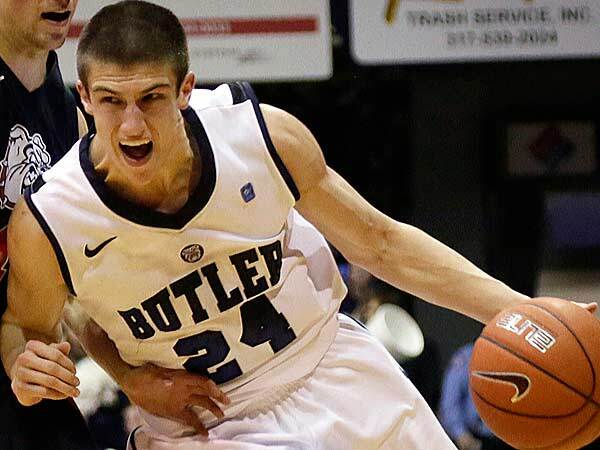 Overall, Butler is pretty solid defensively and has held their opponents to an average of 62.5 points per game. Their schedule may leave an impression that they are unproven and untested, but even though they lost key games to Oklahoma State and LSU, they showed that they can hang with the big boys. Villanova has been and will be a guard driven team, they need to get it going on offense once again on the floor or on the foul line. It can’t just be one person, everyone has to chip in.